The Vital Statistics department in the St. Charles Parish Clerk of Court handles the vital records for the parish. The office is in the St. Charles Parish Courthouse on 15045 River Road in Hahnville, LA. The parish website also links to a subscription based public records search index. Marriage records in the index are available from 01/01/1958 to the present, and other records are available from different dates. A one month subscription costs $50 and gives unlimited access to the index and images therein. A $1 charge for each printed page is also attached. Users can create and pay for an account all online, without having to print out and mail a physical application. 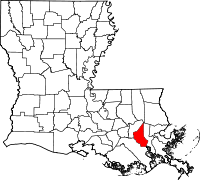 St. Charles Parish is located close to, but not quite on the Gulf of Mexico, and as such, over 30% of the parish is comprised of water.